This O-Ring set is made of White PTFE, has a durometer of 55D, and includes 382 pieces covering 30 dash sizes. The rings have a Round cross-section and can be used across a wide temperature range from -328 degrees F (-200 degrees C) to 500 degrees F (260 degrees C). The rings come in a plastic storage case designed for organization and portability. Designed for use in a variety of sealing applications, this PTFE O-Ring set meets standards defined by Aerospace Standard AS568A for quality assurance. 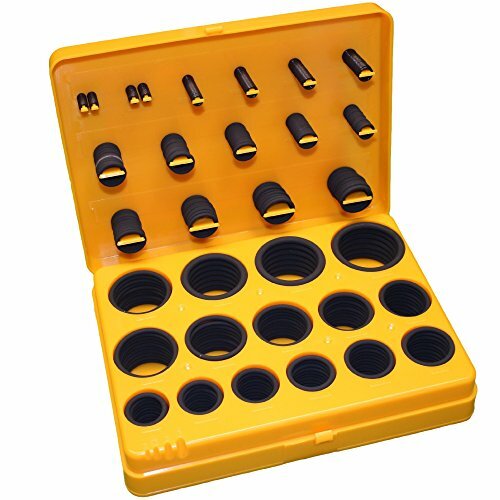 The set includes the following O-Rings: 20 pieces each for dash sizes 006, 007, 008, 009, 010, 011, and 012; 13 pieces each for dash sizes 110, 111, 112, 113, 114, 115, and 116; 10 pieces each for dash sizes 210, 211, 212, 213, 214, 215, 216, 217, 218, 219, 220, 221, and 222; 7 pieces each for dash sizes 325, 326, and 327. PTFE has excellent heat, fuel, and chemical resistance. It can be used outdoors, with lubricants, hydrocarbons, acids, alkalis, detergents, alcohol, ketones, steam and refrigerants, and also has good electrical resistance. PTFE is vulnerable to high vacuum seals, low compression vacuum sealing flanges, and super-heated steam. The durometer hardness of this PTFE O-Ring is 55D. Durometers measure the hardness of a material and its resistance to permanent indentation. A higher durometer value indicates greater resistance to indentation. On a scale of 0 to 100, a value of 0 indicates that a sample was completely penetrated, while a value of 100 shows no indentation in the sample. The letter following the number identifies the shore scale, which is either shore A or D. Shore A is used for rubber, while shore D is used for harder plastics. O-rings provide a pressure and fluid seal between cylindrically shaped, overlapping mating surfaces and are commonly seen in engines, faucets, flanges, valves, and various cylinders. They are circular in shape, with a round cross section, and a hole in the center, similar to a doughnut. O-rings are available in various AS568A dash sizes as well as Metric sizes. O-ring size is defined by the inside diameter (ID), outisde diameter (OD), and cross-sectional (CS) diameter.